A number of sites recommend that you maintain your furnace in the spring or fall to ensure that it works properly in the winter, including changing the air filter and checking your oil supplies. You should also clean out the blower assembly during your seasonal maintenance checks. Dirt and dust can settle inside the blower assembly over the summer, or the contaminants can build up inside it during the winter. Without the properly assembly cleaning, your furnace can potentially overheat and fail. Here's more information about the blower assembly and how you can get it ready for the cold season. 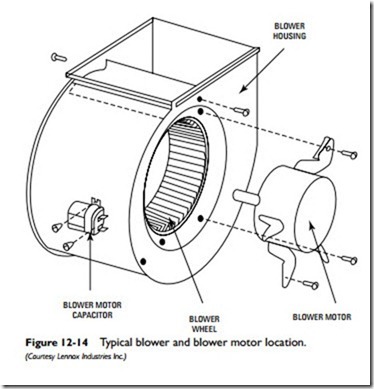 What Exactly Is a Blower Assembly? The blower assembly is actually three parts: a squirrel cage, blower fan, and blower motor. The fan lines the inside of the cage and resembles a large, spinning hamster wheel. It connects to the motor, which sits in the center of it. Even if you use gas to fire up your furnace, the motor relies strictly on electricity to operate. The electrical parts of the motor can stop working if it overheats. Dirt accumulation is one of the most common reasons for an overheating motor. Dirt can also coat the surfaces of the fan and prevent it from spinning. Overheating can also crack the furnace's heat exchanger if it becomes too hot, which can be potentially dangerous. During normal operation, the heat exchanger receives heated air from the blower system and distributes it throughout the house. A damaged heat exchanger allows toxic gases to seep out of the furnace. If the exchanger does crack, it's generally recommended that you replace it right away to keep your home and family safe. To keep your blower motor and fan in good shape, clean them. What Can You Do to Keep Your Blower System Safe? You'll need to shut down your furnace's electrical and gas supply before you clean the blower assembly parts. Next, locate the assembly, which is typically found behind your appliance's air filter compartment. If you can't remove the paneling over the blower assembly by hand, use a screwdriver instead. After you locate the blower assembly, use a vacuum to remove any dust and dirt from the squirrel cage. If the vacuum doesn't clear away the debris, gently pull out the blower cage and use a slightly damp rag to wipe down the fan. Avoid placing water directly on the motor, or it may become damaged. You can clean the motor with a dry rag instead. If possible, place a few drops of non-detergent household oil into the ports of the motor. The oil will help keep the motor's electrical parts from burning out. If your furnace experiences any issues with its blower assembly this year, contact an HVAC specialist for further assistance.